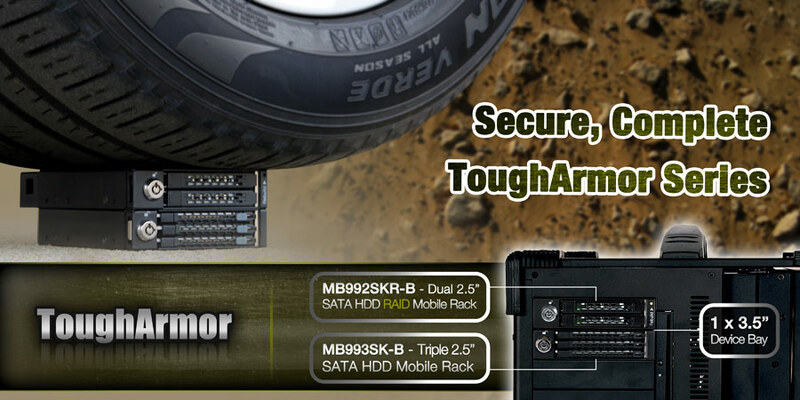 Enter the ToughArmor MB516SP-B. While it looks like two MB998SP-B’s stacked on top of each other, there is more than meets the eye in order to pull this trick off properly. We'll focus on that further into the review, but for now, let us get through the specs. Continue reading for our full review! Podcast #398 - AMD Radeon Pro Duo Review, Godavari Refresh, ECS Z170-Claymore, ICY DOCK hot-swappable SSDs, and more! Join us this week as we discuss the AMD Radeon Pro Duo Review, Godavari Refresh, ECS Z170-Claymore, ICY DOCK hot-swappable SSDs, and more! Josh: Need a local Git? Look no further! ICY DOCK has made themselves into a sort of Swiss Army knife of dockable and hot-swappable storage solutions. From multi-bay desktop external devices to internal hot-swap enclosures, these guys have just about every conceivable way to convert storage form factors covered. We’ve looked at some of their other offerings in the past, but this week we will focus on a pair of their ToughArmor series products. As you can no doubt see here, these two enclosures aim to cram as many 2.5” x 7mm form factor devices into the smallest space possible. They also offer hot swap capability and feature front panel power + activity LEDs. As the name would imply, these are built to be extremely durable, with ICY DOCK proudly running them over with a truck in some of their product photos. Read on for our full review of the ICY DOCK ToughArmor MB998SP-B and MB993SK-B! You may want to build a server consisting of enterprise level SSDs to make sure it provides the best possible speeds to anyone accessing data stored there but the chances of you getting the budget for it are slim going on none. That is why reading the guide on building servers from Modders Inc is worth your time if you find yourself pondering the best way to build a storage server on a budget without making it abysmally slow. You have many choices when you are designing a storage server but if you are not quite sure where to start the list of components and the arguments for their usefulness will get you headed in the right direction. For example the LSI MegaRAID SAS 9271-8i is an impressive RAID controller and with good SAS HDDs you can expect to see very good data throughput and will be more important than the CPU you select. Check out the article right here. "IT infrastructure and storage has always been part of serious conversation between IT engineers and their bosses. As always IT Engineers want to use the best of the newest technologies while their bosses want to keep every project under a tight budget. It's always an ongoing battle, however both sides always come to some mutual agreement that benefits both sides." Techgage has an assortment of Icy Dock products that they examined to make up this review. The ICY CUBE MB561U3S-4S is a 4-bay external drive enclosure, which will take all of the installed drives and create a single volume out of them. This happens automatically, there are no other RAID options available when you use this particular dock but it does simplify the setup process. 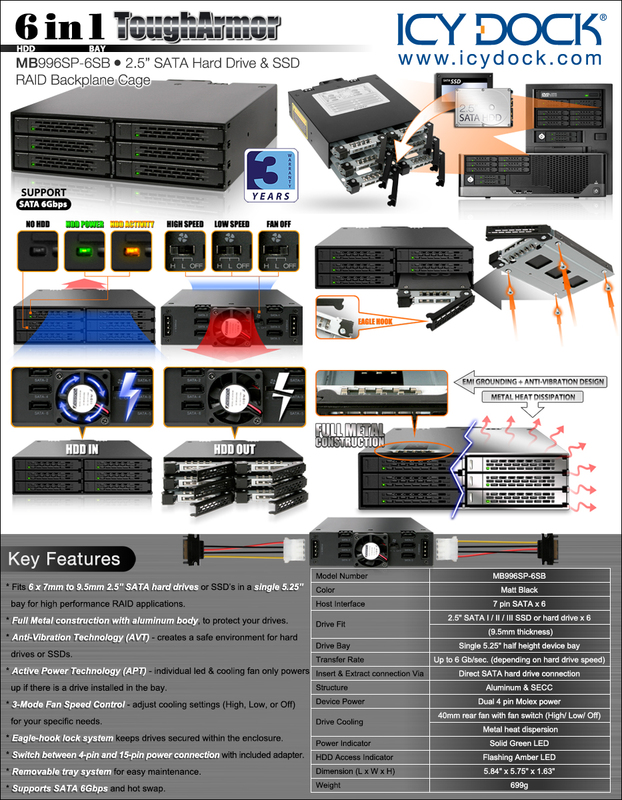 The MB662U3-2S is a two bay enclosure which offers more choices for setup, you can set the drives to Large, JBOD, RAID 1 or RAID 0. If you just have a single drive, they also have an external 3.5” SATA HDD enclosure and finally two HDD caddies which slide into a 5.25" drive bay. The first can be set up to fit a pair of 2.5" drives and the second is for hotswapping. Check them out if you are in need of storage accessories. "It has been quite some time since we have looked to see what ICY DOCK has been up to. This is a company that established its reputation by making some very good hard drive accessories through the years. In this article we are going to take a look at several offerings from the company – from mobile to desktop. Let’s see what it has to offer." Do you find yourself wishing you had more space to put in an additional three 3.5" HDDs and have nothing to do with a pair of 5.25" bays? Icy Dock has a solution for you with the FatCage MB153SP-B which takes up two 5.25" bays and can fit three 3.5" SATA drives, even better it can run them with only two SATA power connectors. Thanks to the easy opening front this might just be the easiest way to add hotswap drive to your machine without needing anything hanging off of the outside of your box. As you can see from the rear shot, the drives are actively cooled and Pro-Clockers did indeed test the compatibility of 2.5" to 3.5" SSD adapters with no problems whatsoever. "There are several manufacturers of such devices but we have one of the better ones on tap for you today. Icy Dock has been doing this for over fifteen years and has become a leader at it. FatCage MB153SP-B is one of several models coming from Icy Dock; the series would include the DataCage Basic and the FlexCage. Each having their own unique features, so we will try and get them into the lab so we can give you more insight on them." Hard drive enclosure manufacturer ICY DOCK has launched its new Blizzard enclosure that is designed to keep your 3.5” hard drive cool. Putting a fast hard drive in an external enclosure can shorten its lifespan if it does not provide proper airflow. As the name implies, the Blizzard takes cooling to the extreme by placing an 80mm fan at the front of the enclosure to ensure that the 3.5” hard drive is nice and chilly even when under heavy load. Specifically, ICY DOCK has released the MB080U35-1SB and MB080USEB-1SB. The former is the USB 3.0 model while the latter foregoes USB 3.0 in favor of Firewire. The enclosure itself is all back and constructed of ABS with a metal frame. It measures 237.5 x 126 x 146mm and weights 646 grams. The Blizzard enclosure can hold a single 3.5” SATA desktop hard drive. The front of the case is a diamond shape and hold the 80mm fan. From there, the case tapers back into a form-fitting rectangular shape a bit larger than the hard drive it is holding. Exhaust ports are present at the back and the front grill is used as a large intake. The fan is LED lit with a dimmable blue light. Further, a fan speed switch allows setting the fan to high, low, or automatic speeds. Should the drive temperature go above 50 C, the front LED will turn a red color. At the top-front of the drive enclosure are two LED lights–a solid green LED for power and a flashing orange LED for indicated hard drive access. On the side are two large release buttons that allow the front to be pulled off and hard drive to be inserted or removed. Aside from the fan and the resulting odd shape, this enclosure is fairly standard. If you need fast rotating storage though, that fan design may be very important. When one of my WD MyBook drives died, I swapped it out for a 7,200 RPM hard drive I had lying around and used it as a backup-backup drive (lest it simply act as a dust catcher). It would get warm to the touch, so while it may be overkill for many people some might find it useful if you absolutely need large amounts of fast storage in an external enclosure. 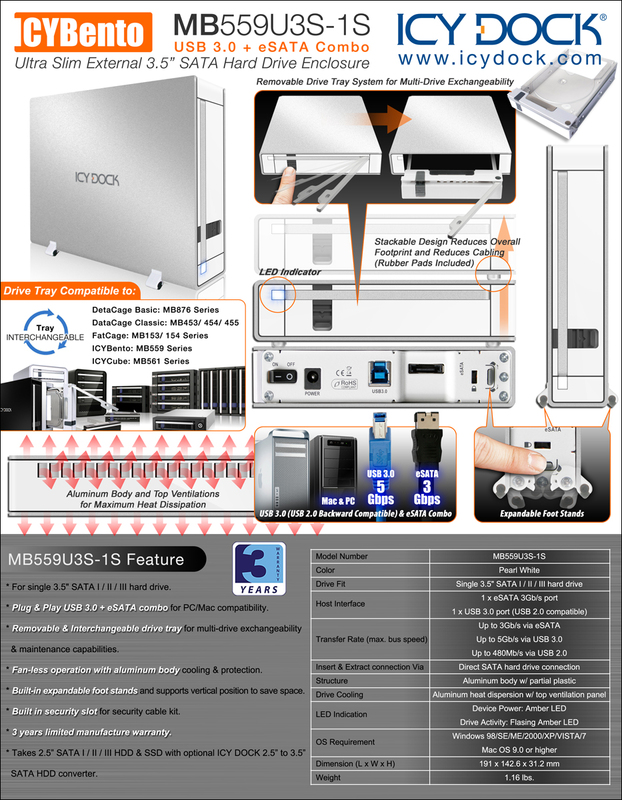 As mentioned previously, the MB080U3S-1SB model features a USB 3.0/USB 2.0 and a eSATA connector on the rear of the device for connecting to your computer. The MB080USEB-1SB model, on the other hand, features USB 2.0, FIrewire, and eSATA ports. Also included on the back of the device is the fan speed switch, LED dimmer, power switch, and power jack. While the Icy Dock website does not list an MSRP, the enclosure can be found for around $70. It is currently listed for $71.99 over at Newegg, for example. I’ll admit that it’s a rather odd enclosure, but if you have the desk space and want to keep your drives nice and chilly this appears to be a decent option. No Thunderbolt support, but as Ryan found out, you would need a multi-drive array to really get your money’s worth out of Thunderbolt (so for a single hard drive, USB 3.0 or eSATA should be fast enough). You can find more photos and information on the Blizzard enclosure on the company's website as well as a video of it below. What do you think of the external hard drive enclosure?